A weekend of cooler temps has got everybody looking forward to the changing season of losing our hot, humid summer and welcoming the kiss of cooler nights and eventually cooler days. Had fun at Saturday's auction and won some lovely items. 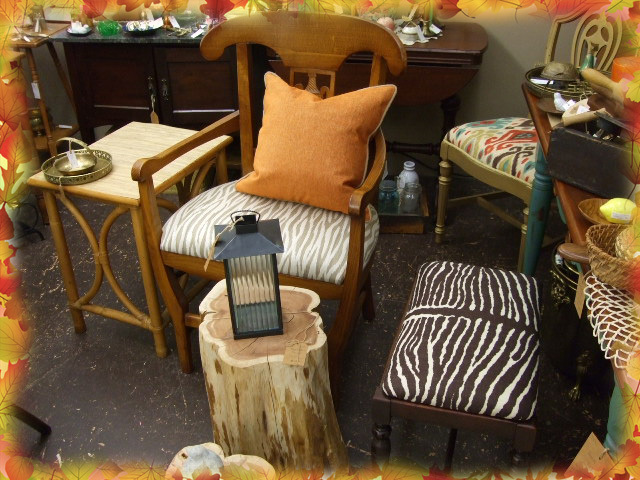 Brought them into my spaces today but so many of the Queen's dealers have begun dressing their booths for fall that I had to share all of that autumn goodness. 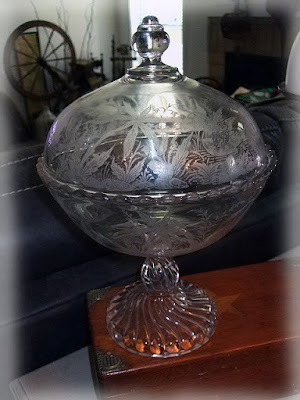 Look for a later post on my weekend treasure hunt. Everyone at the Buford Queen of Hearts is feelin "fall" all around. 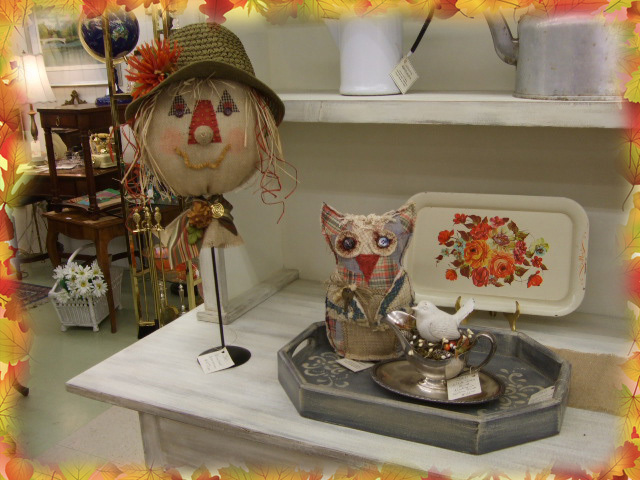 Adorable scarecrow and owls created from repurposed vintage quilts. 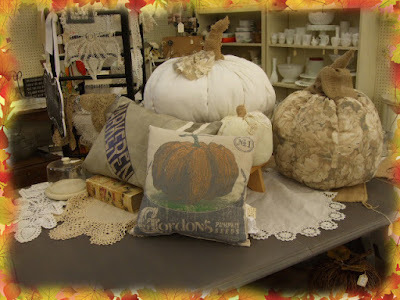 These are pure autumn delight. 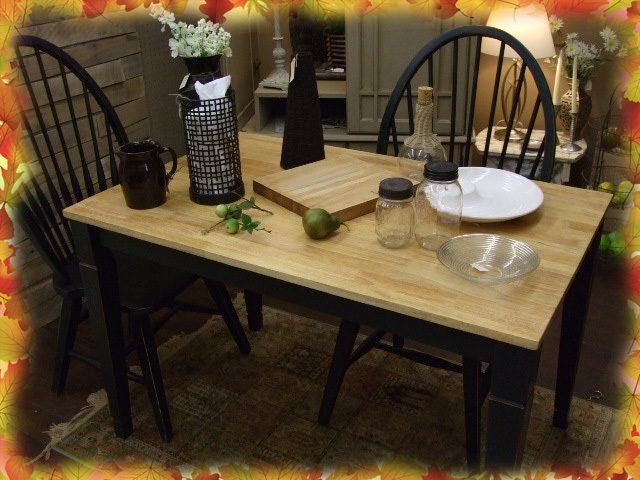 Holiday entertaining will be upon us shortly and this lovely dining room set is looking for a new home. This space always has the coolest decorative pillows. Pumpkins of every color and fabric are ready to set the harvest mantle and table. 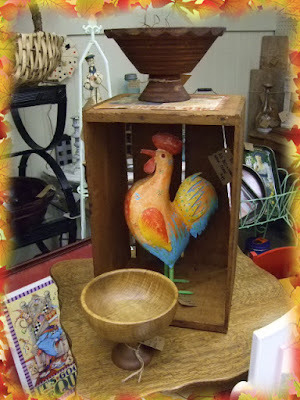 Decorative crate, wooden bowls and a happy rooster. 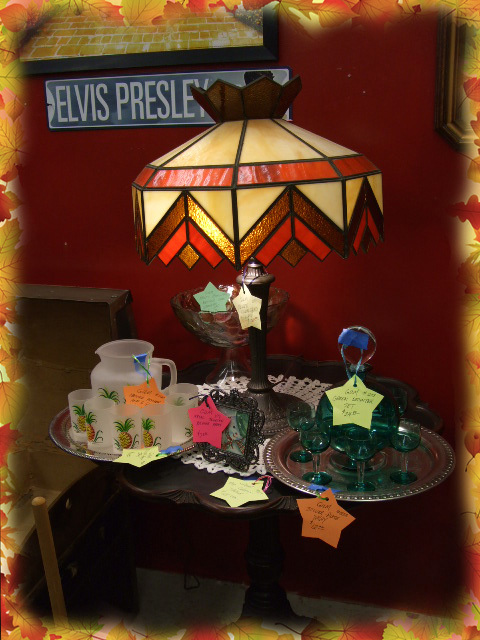 Lovely leaded, stained glass lamp is warm with fall colors. 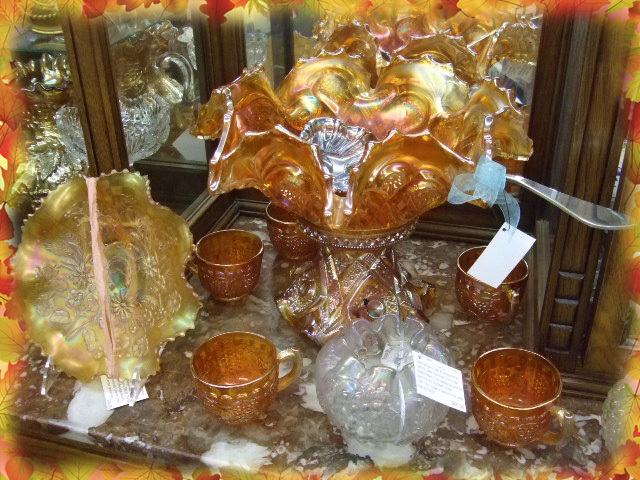 Antique marigold carnival glass will set a lovely Thanksgiving table. Sweet little rag doll looks comfortable on this pretty ladderback chair. Soft, neutral tones are lovely for fall. 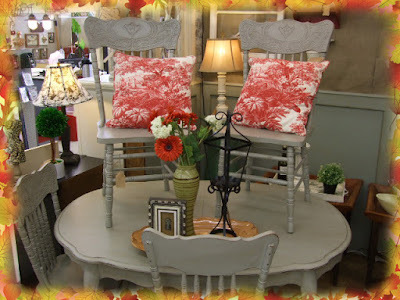 Now is the time to start looking for those furniture pieces you will need for the holidays. This little pumpkin gal is ensconced in velvet and looking all cute. 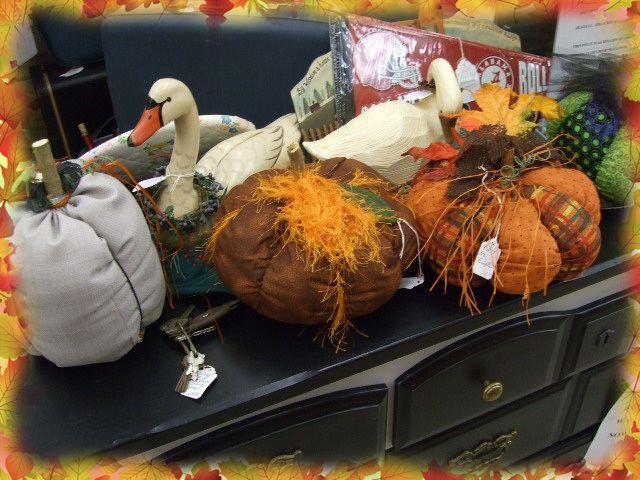 Pumpkins and geese, a winning combination. This space always has the most elegant of decorative elements. How can you not smile when you see all of this marvelous fall treasure. 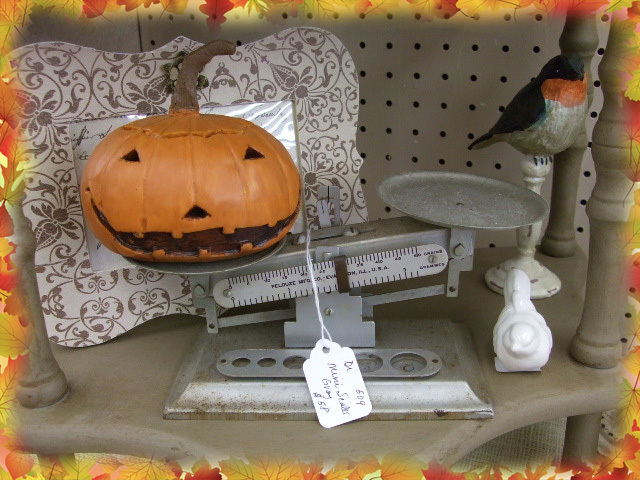 Delightful Jack O Lantern is happy sitting on this little scale. 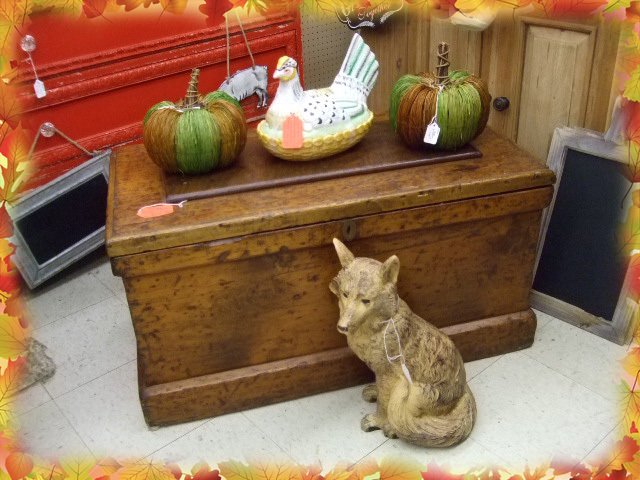 Gorgeous, primitive blanket chest and fall pumpkins. 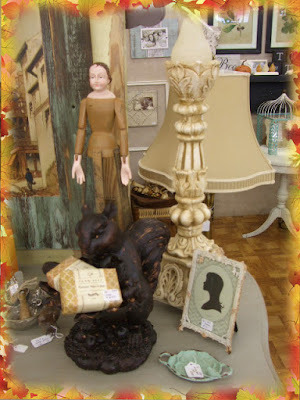 Don't forget the sweet fox. 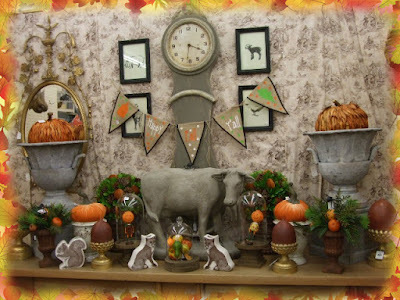 I want everything on this mantle. 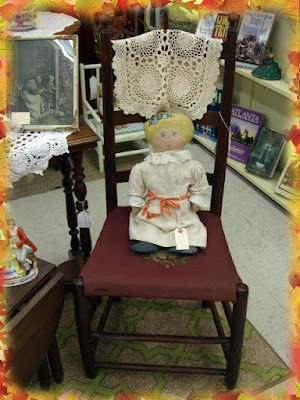 My heart beats faster when I see windsor style chairs. What a lovely table set. Get your game wreath on, football is a fall tradition. 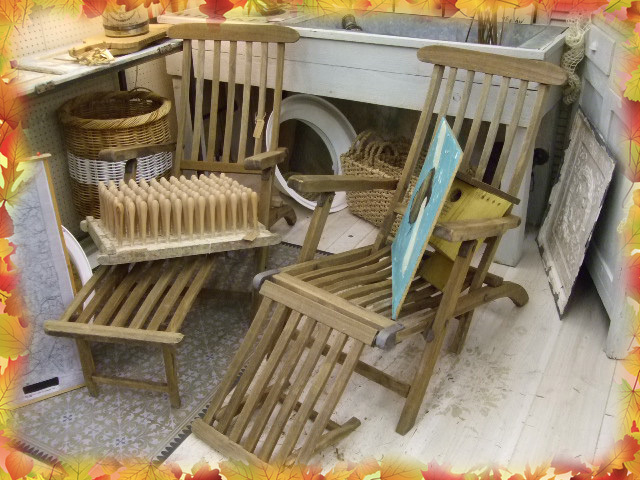 The summer may be nearly over, but you can switch over from cool drinks to something hot, wrapped up in your favorite blanket as you sit on these vintage beach chairs. Serve homemade pumpkin soup in this pumpkin soup tureen. 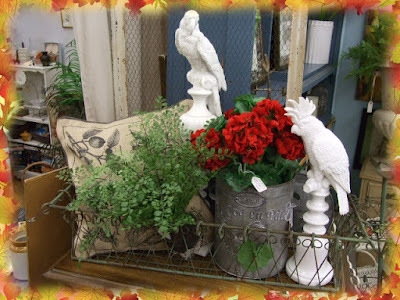 Wire containers filled with dries and silk and nested pillows are a winner. A few touches of Halloween are also popping up. 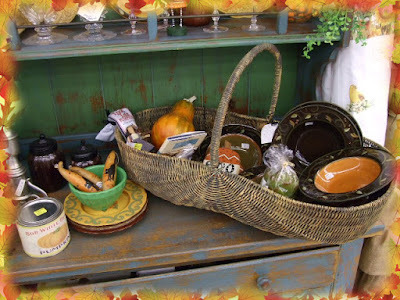 Great looking basket is filled with everything you need to begin your table service. 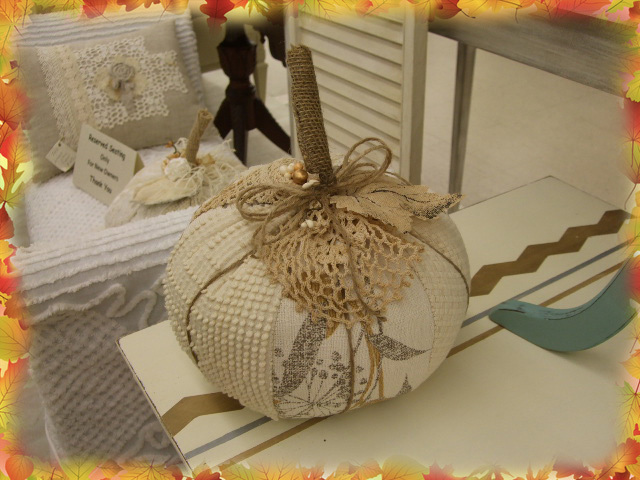 Love those soft neutrals, they enhance all of what fall decorating has to offer. 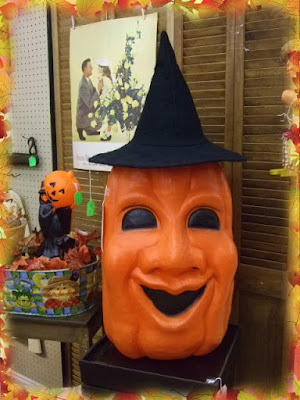 Head over tea kettle with mad love for this huge, vintage pumpkin and witch hat and a lovely way to conclude this post. 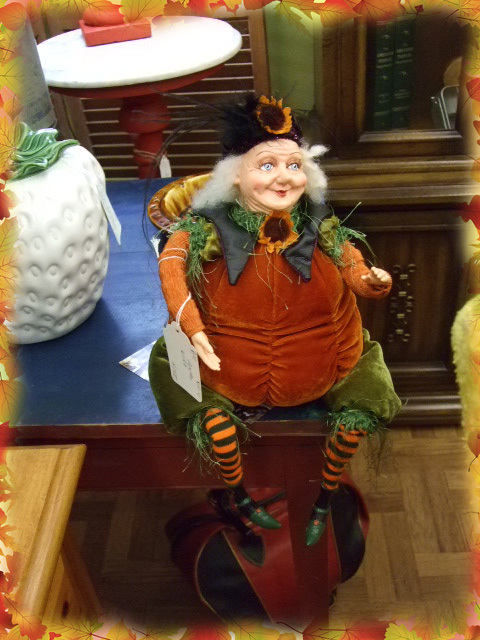 I am looking forward to the next few weeks as I watch the Queen of Hearts transition from the end of summer into the warmth of fall. Lots of fall events are scheduled for the three locations at the Queen of Hearts Antiques and Interiors. I will be posting that info on my Facebook page. sing it to me sweetly, Bono. Still haven't found that cupboard that I am looking for. 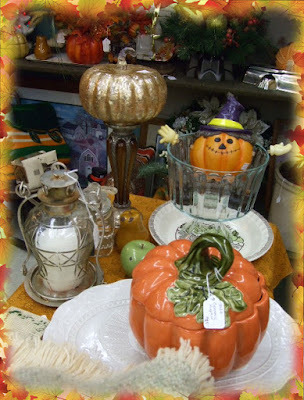 So I made a cupboard hunting pilgrimage to Monroe, GA where there are many "HUGE" antique malls. Thought I would find it there, but no such luck. 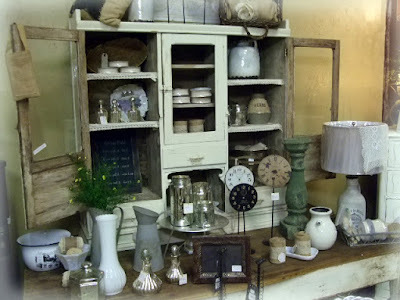 I have to stop looking for that elusive cupboard and let it find me instead. Still, it was a lovely day to be out and about and the first day I have felt half human as I get over this bout of stomach virus. Started off at Hodge Podge Art, Antiques and Interiors where a lot of new dealers have taken up residence. 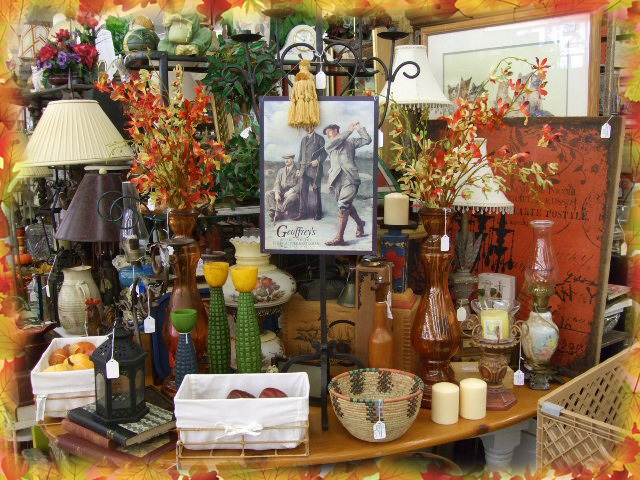 You can tell that everyone is looking forward to the cool nights of fall as they begin changing out their spaces from summer fun to cozy autumn. Beautiful drieds, a cute nanny goat and vegies everywhere. 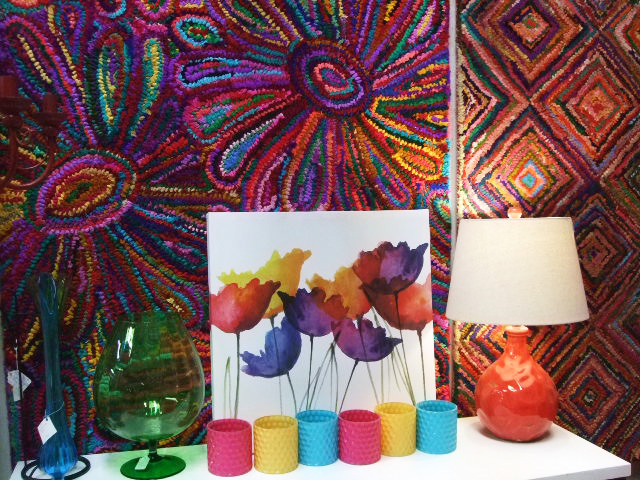 This space is so joyful with its rich, riot of jeweltone rugs. It's always the case, I was interested in this table top cupboard but the tag said NFS. 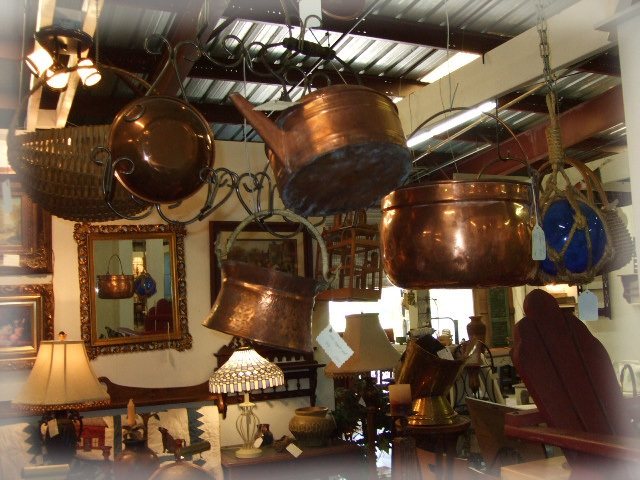 These warm copper pieces suggest cooler days ahead where kettles filled with water heating upon the stove will soon bear cozy teas or hot chocolates. 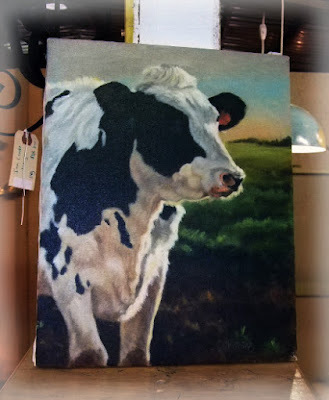 What a sweet face, lovely acrylic painting. One of my lovely daughters in law would be ga ga over this. 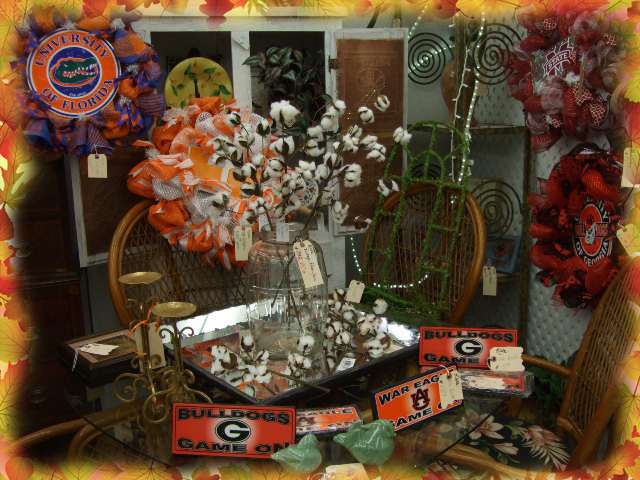 On to one of my favorite dealers in Monroe, James at Davis Street Antiques. Still no cupboard but there is always treasure at Davis Street Antiques. Marvelous retro 1950s coat of black satin with huge buttons. This is too cha cha for words. 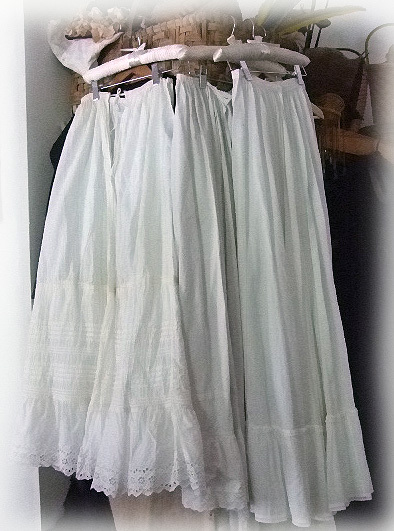 Love Victorian/Edwardian whites and I found several there. 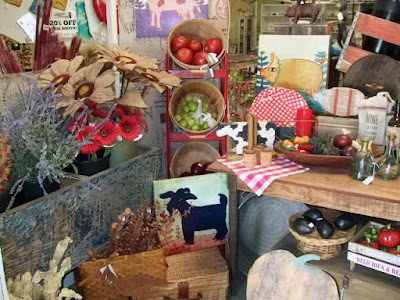 From Davis Street I headed to Ian Henderson's Antique Mall. 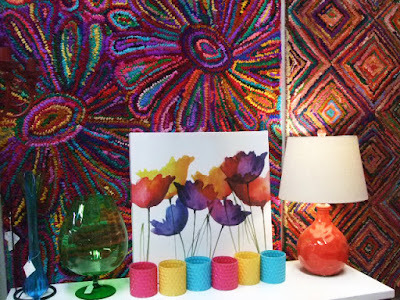 Open 7 days a week, in the former Walton Mill, they live up to their tag line, 100,000 square feet of awesome. Would I find my elusive cupboard? 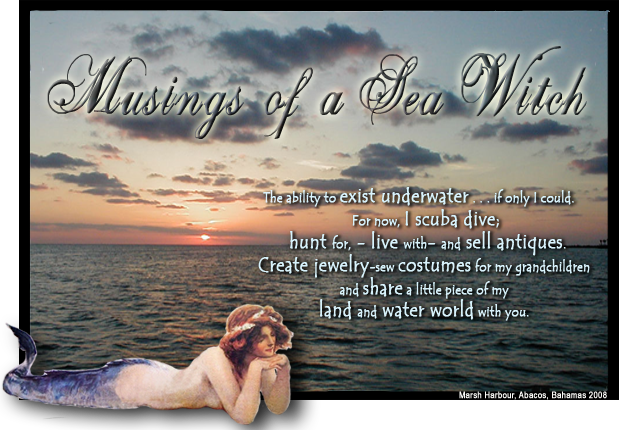 Nope, but I found Neptune's triton, I found treasure. 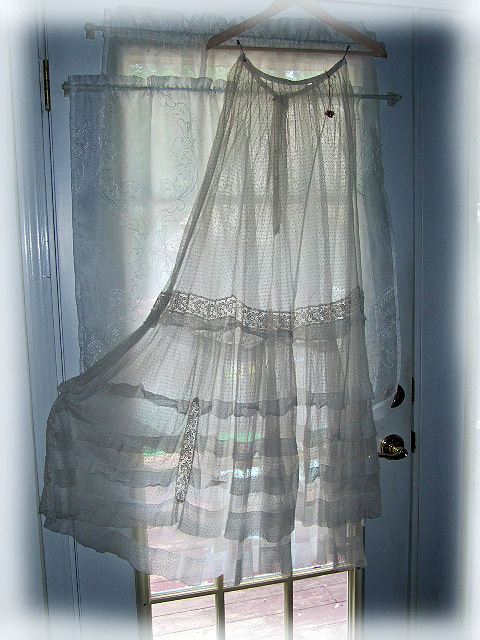 Love this Edwardian net skirt with bustle room to boot. This is a piece that I will keep and wear. Be still my heart. I am head over tea kettle with this find. A Civil War era Chantilly lace shawl. 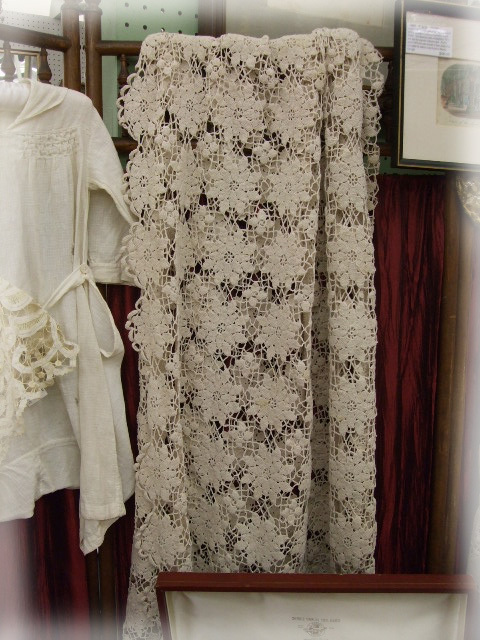 These are so delicate and gorgeous and I have lusted after one for years but their price is often way out of my budget. This one was priced to move as it had a few lace tears along each end but it was so worth it to me. The fun at Ian Henderson's Antique Mall are the finds. So many booths to explore and always a unique item to be found. 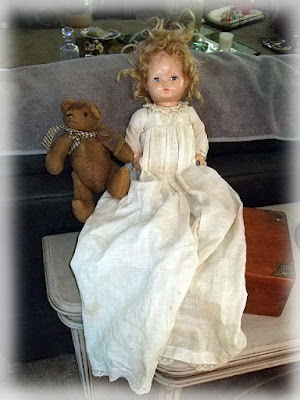 Great old celluloid dolly with hair that looks like mine when I first wake up. An adorable little jointed hand made bear will find it's way to a Christmas display come December. As I checked out at the register, Ian Henderson himself not only waited me out but actually remembered me from a visit last September and the blog post I wrote about my visit. WOW, with the hundreds of thousands of people that walk this spacious antique mall, Ian remembered the Sea Witch. Now that is amazing customer service. Sheffield knives in what looks like never used condition in their original presentation boxes. 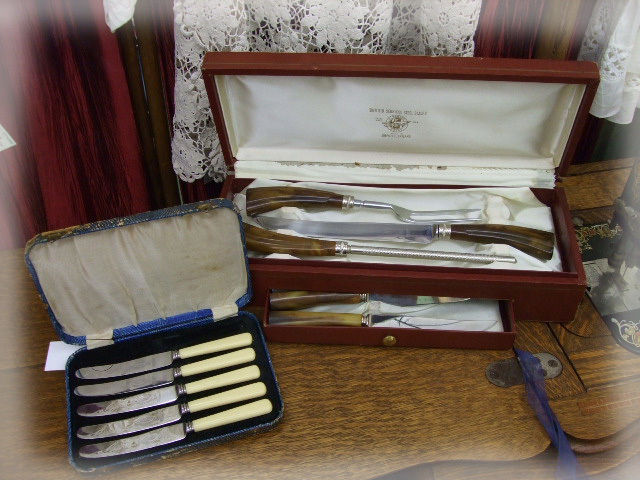 Bakelite handles on the carving set and celluloid handles on the small butter knives. These were an auction win from last week but I was sick with the stomach virus and I had forgotten to pull them from the car. Found them this weekend. A local thrift store find, gorgeous EAPG covered compote. Huge and acid etched uranium glass of feeding swans. Circa 1880s. 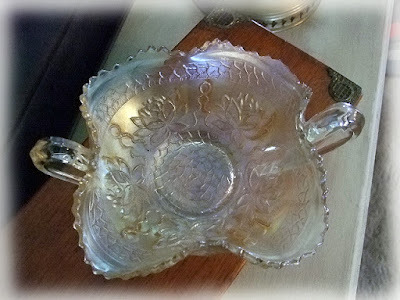 Pretty, early Carnival Glass of water lilies. Double handles and in perfect condition. 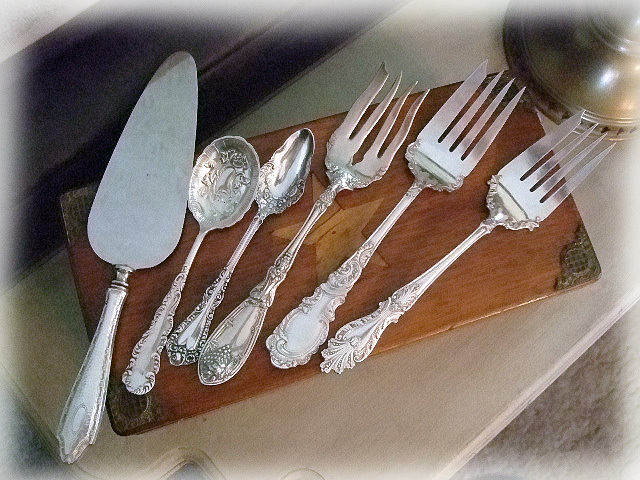 The season for family entertaining will be here sooner than you think and I scored with this group of serving forks and sterling handled cake server. Love this old brown transfer ware plate of herons. 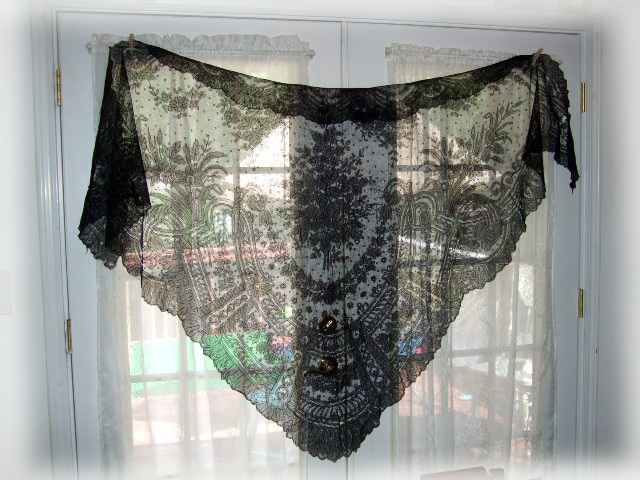 Still looking up the maker and pattern. 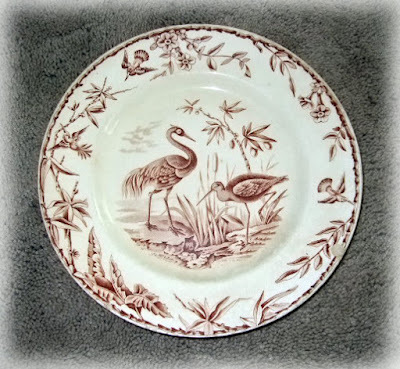 May not part with it as I adore the theme. 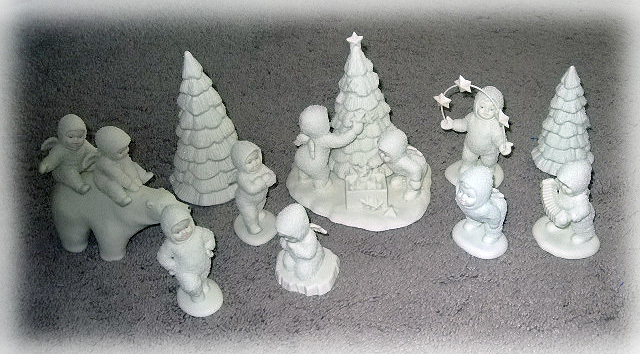 Who doesn't love snow babies and I acquired this group for such a steal that is would have been sinful not to take them. Come December, they will be in my main space at the Buford Queen of Hearts. So glad to find this antique crocheted tablecloth. 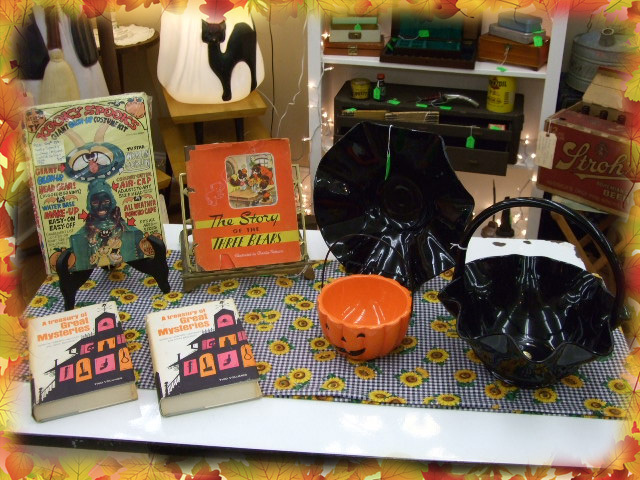 These items have been selling as fast as I can bring them into my booth space. 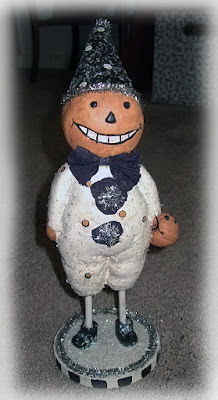 Another thrift store find, he's just to cute for words. Stopped by Vintage Village and nearly squealed with delight when I found this pair of vintage noisemakers. 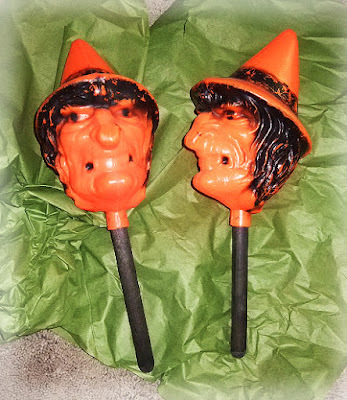 I remember carrying these as a child in New Jersey on Halloween. 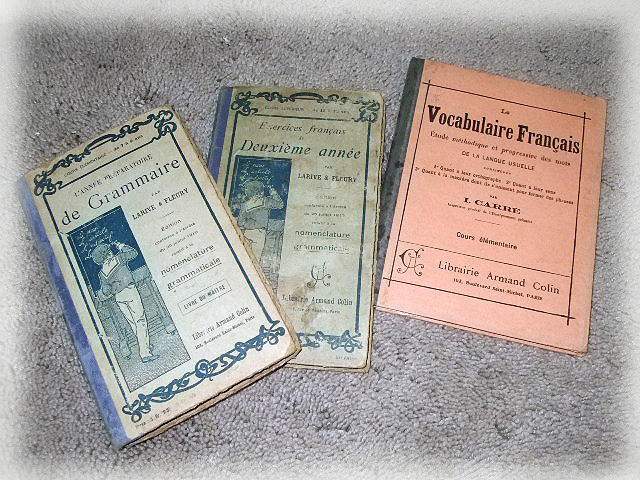 Sweet set of French grammar books from the 1900s. 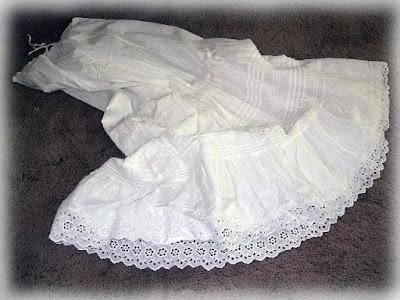 Yes, another petticoat. 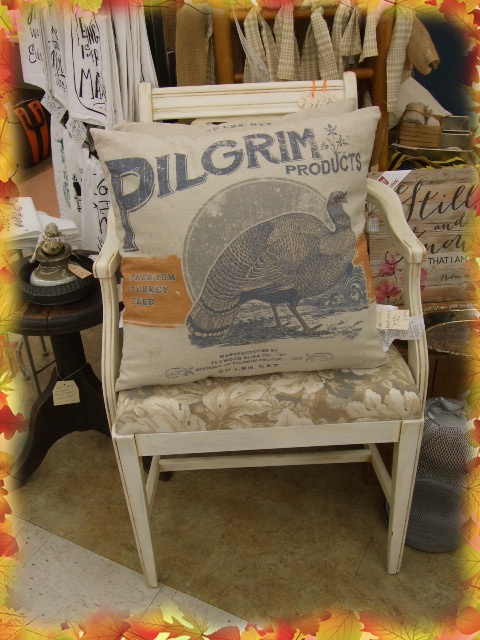 It was a great weekend for finding these gems and at good prices. 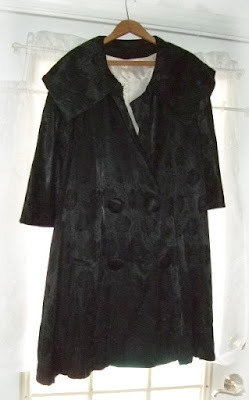 And finally, at a yard sale, picked this beauty up for $1.00. Sometimes dropping in as they are shutting down is the best time for a great buy. 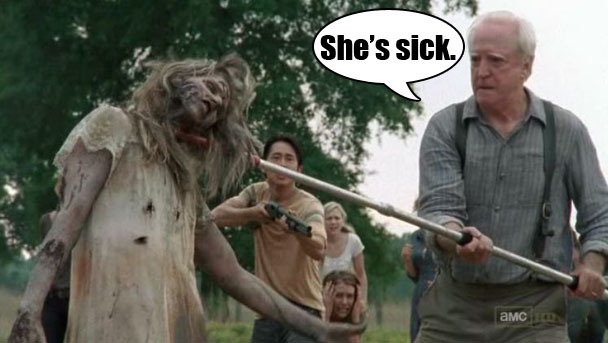 Have been feeling like one of the Walking Dead this last week. Came down with that nasty stomach bug that has been making the rounds and it really kicks you in the gut. I've been camping out in there for days and hopefully, I have turned the corner on this. Drinking lots of fluids and embracing the BRAT diet until my stomach stops turning in knots. So yea, this is pretty much me. 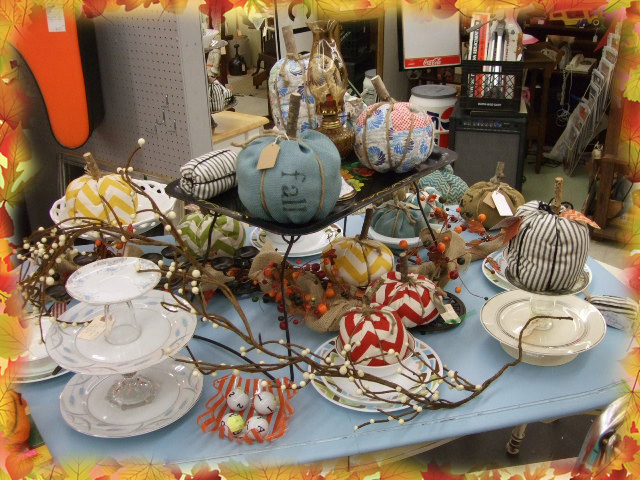 Now before all of this hit, I had a great time at the last auction and came home with some great pieces. Gorgeous Victorian, quadruple silverplated punch bowl. 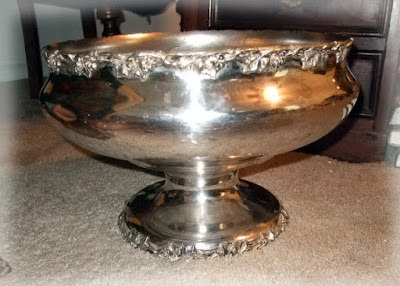 This looked a mess with lots of black patina and tarnish and bidders were afraid of it. 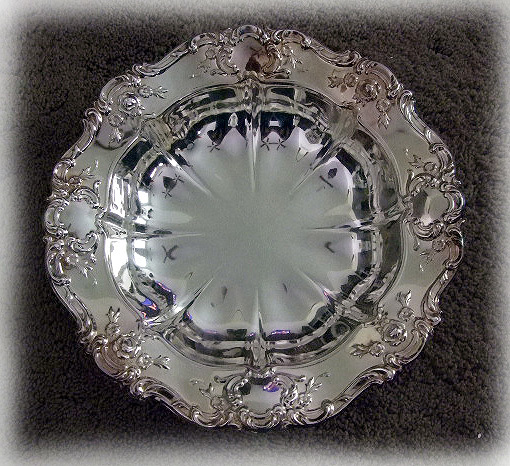 Was really glad to win the piece and it sure polished up beautifully and will be a marvelous piece for the Victorian, quad collector. Vintage jewelry always goes for prices higher than I have in my budget, but I walked away a big winner with some beautiful pieces. 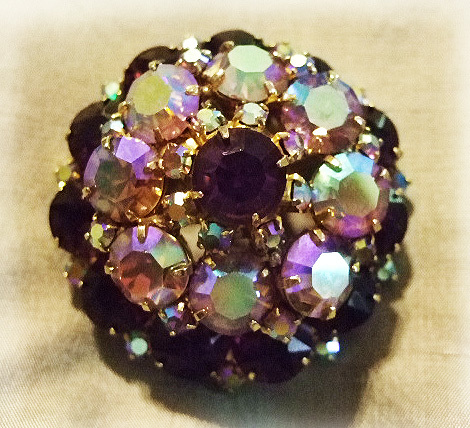 Gorgeous dome brooch with hand set aurora borealis and amethyst stones in a gold wash setting. 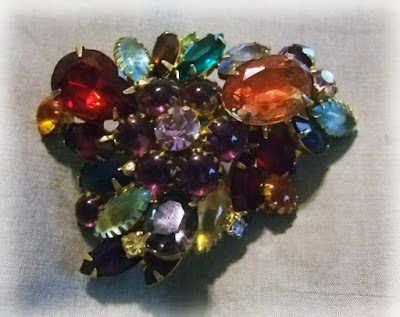 Another big vintage brooch with faceted and cabochon cut rhinestones, all hand set in a gold wash setting. Rich jewel tones make this the perfect brooch for fall. 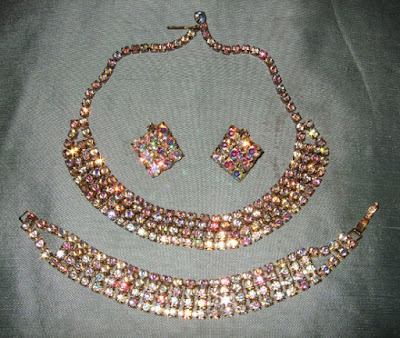 Elegant amethyst and aurora borealis rhinestones hand set in a gold wash setting. 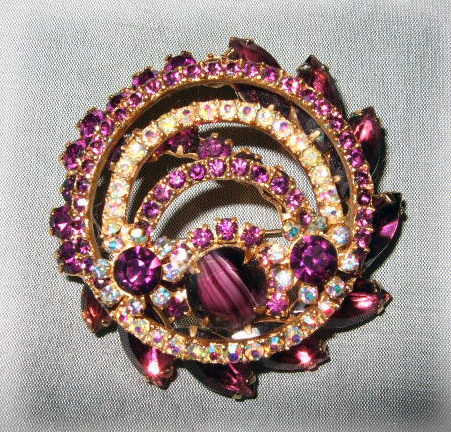 My favorite of these four brooches, this has such fire and beautifully set. 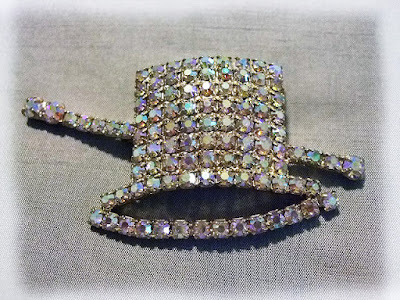 You'll be puttin on the ritz with this sassy rhinestone brooch. Pair of fiery, vintage rhinestone earrings sets. Gorgeous "Parue" of aurora borealis rhinestones, hand set and full of fire. 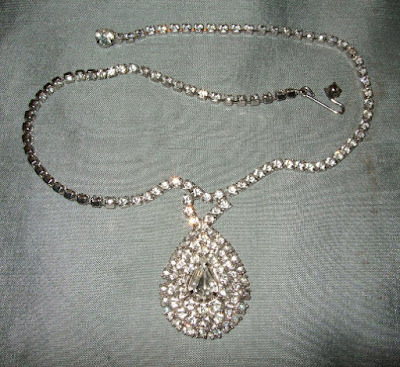 Lovely, vintage, Miram Haskell rhinestone pendant necklace. 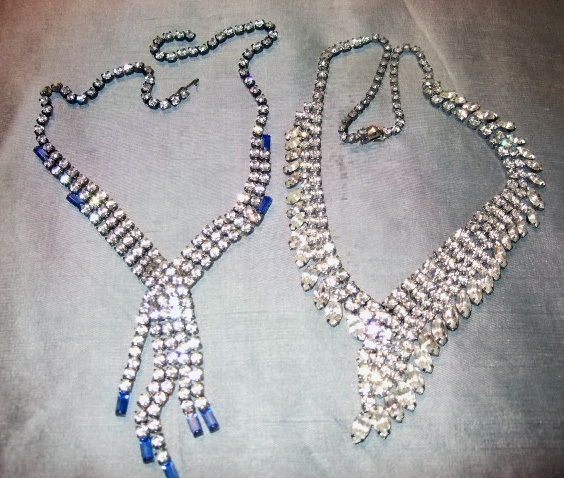 Lovely pair of vintage, rhinestone necklaces. Stones are set, not glued. 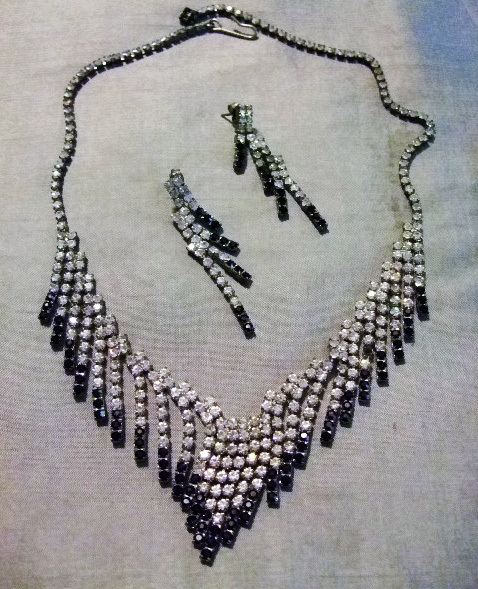 Pretty black and clear rhinestone demi parue set. 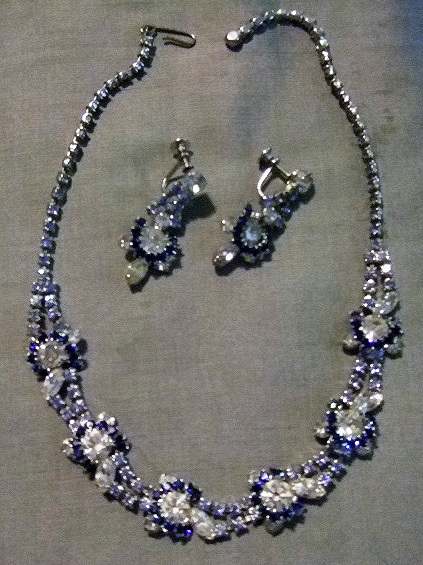 Lovely demi parue set of blue and crystal rhinestones. 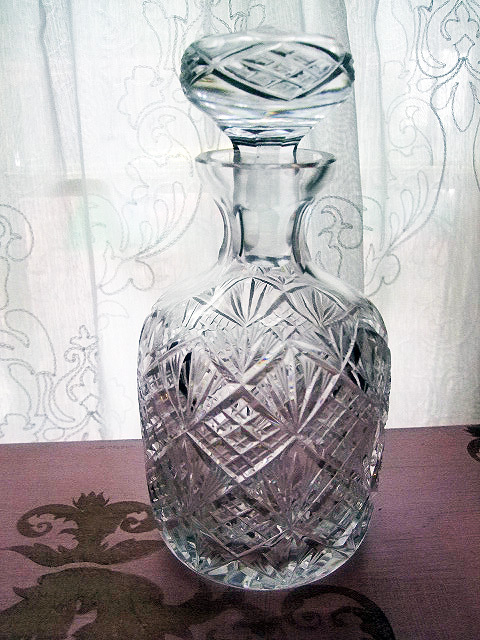 Love cut crystal pieces and this heavy decanter is a beauty. 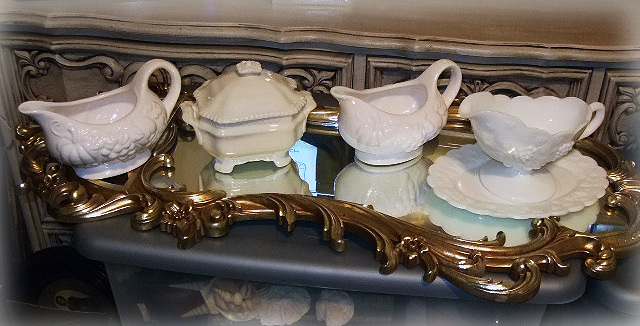 There is something marvelous about gravy boats and tureens. They evoke the best in cooking and holiday meals. These will find there way to my booth space come Thanksgiving. 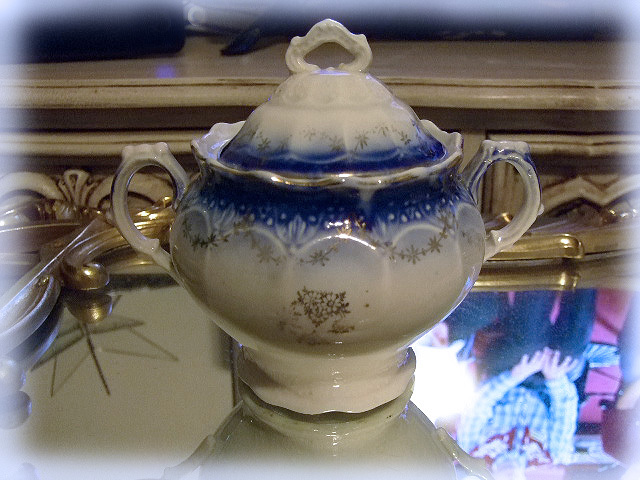 Sweet little vintage, flow blue covered sugar bowl is meant for tea time. 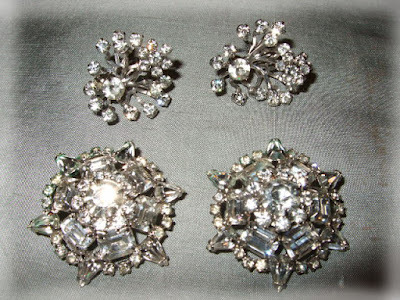 Do you use cubes or crystals? 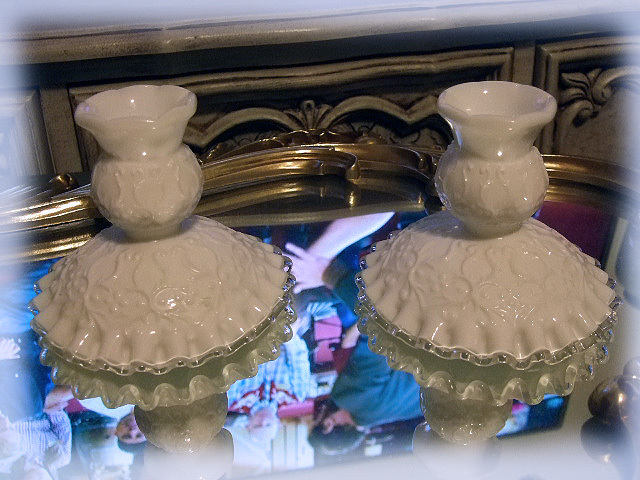 Pretty little pair of Fenton, Spanish lace and silver crest pattern. 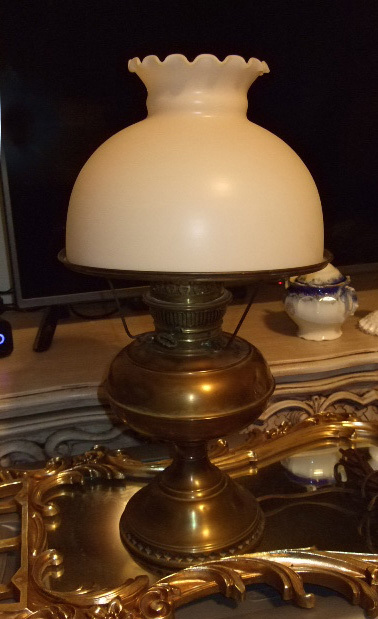 And finally, this electrified, antique brass oil lamp with original glass shade. 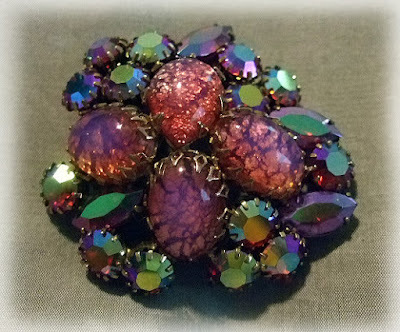 I swoon over these pieces and will be keeping this one.